PLY Issue 5- Behind my Curtain! SO PLY issue 5 has arrived at my doorstep!! I’m super excited about this issue, since not only do I have an article- but it’s a peek behind my curtain! This was a difficult article to write in all honesty.. I can knock out a technique article no problemo.. but something personal about ME?! Why would anyone want to read about a day in my life? I wanted to show a slice of how rewarding and exciting being a fiber artist can be, but also how preciously I schedule my time and my constant struggle to find balance. Maybe if I put it out there, others will help me be accountable.. and maybe I can help someone else realize that balance is important to strive for. I’m so happy to have this article alongside an article by my good friend Lexi Boeger of Pluckyfluff! It’s an issue packed with great stuff indeed! I also have to thank my amazing sister, Eve Edelheit, who’s a photographer for the Tampa Bay Times and New York Times for taking the photos of me that are in the article!! 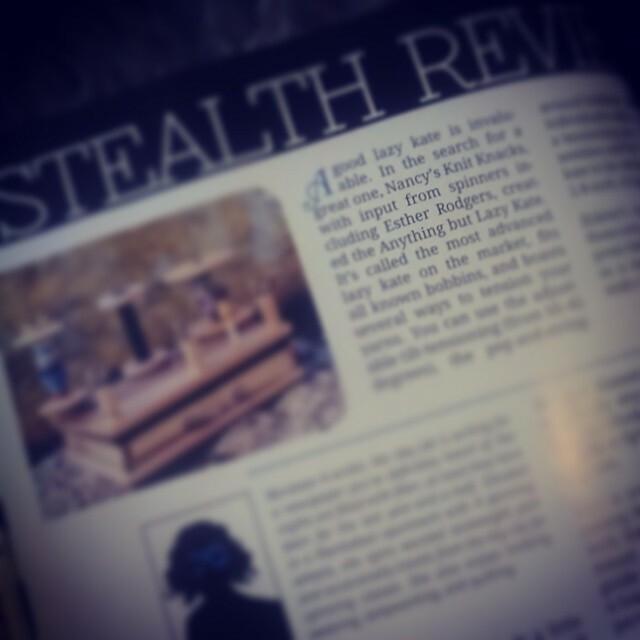 I am also thrilled that the Anything but Lazy Kate that I helped Nancy’s Knit Knacks design a couple years ago, got “Stealth Reviewed” with GLOWING results!! This lazy kate came about because of a conversation I had with Nancy one day at our Local Yarn Shop! I gave her a rundown of what I’d love a lazy kate to have.. portability with all the parts fitting in the base, separate yarn guides, multiple tensioning options including a tilt, and open yarn guides for bulky yarns or add in’s that would usually not pull through. They came up with an amazing design and it’s been a top seller since!! They also developed cone holders so you can more easily ply with cones!! A note.. I’ve been asked a couple times already about the wristwarmers I’m wearing in the article! They are knit and designed by my friend Vithard, and are a FREE pattern!! ← Festing, Weaving, Goatlove and the Glitter Diva- Minnesota Anyone?